What should you expect at one of our shows? It depends on the night, but you can always expect to laugh. Below are the show formats use most. Five directors vie for your favor in this fast and hilarious improv competition. Each actor will tell a story in a different style. ​You decide which story gets to live long enough to be... the SuperScene! The first half of the show is improv games - think Who's Line is it Anyway with a SF twist. The second half is a fully improvised one-act play inspired by you. Short in the front, long in the back, and a party all around! 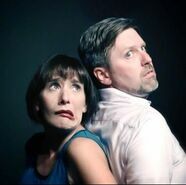 Two pairs of actors serve up their own, unique blend of improvised scenes, stories, and songs. No script, no plan, no safety net. This is improv at its most spontaneous!